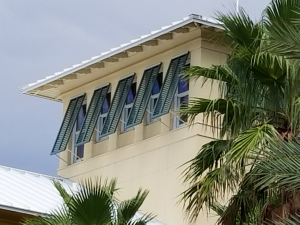 Our aluminum shutters are fabricated from high grade marine quality aluminum extrusions. We have the ability to build your shutters to any width and any length based on your specifications or needs. We offer aluminum shutters prefinished in 30 standard colors or we can finish them in any custom color by request. We also offer a full line of shutter hardware and the expertise to find the correct hardware for your custom application. Please contact us for specifications on our aluminum shutter product line.